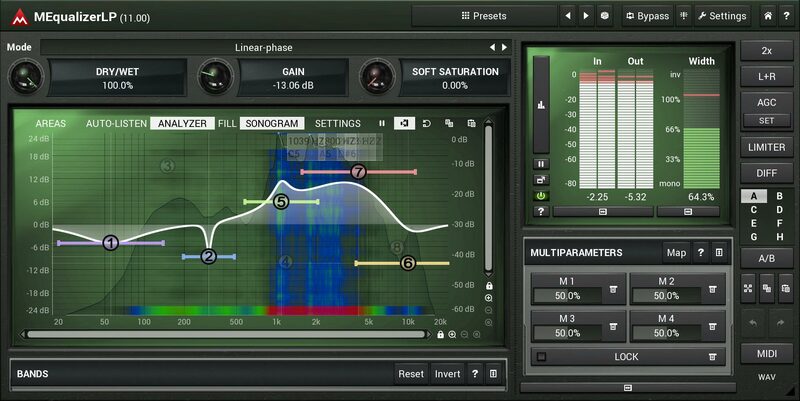 MEqualizerLP by MeldaProduction is a Virtual Effect Audio Plugin. It functions as a VST Plugin, an Audio Units Plugin, a VST 3 Plugin and an AAX Plugin. MEqualizerLP is an 8-band linear phase equalizer designed for mastering. However, due to its very high speed it is suitable for mixing too. 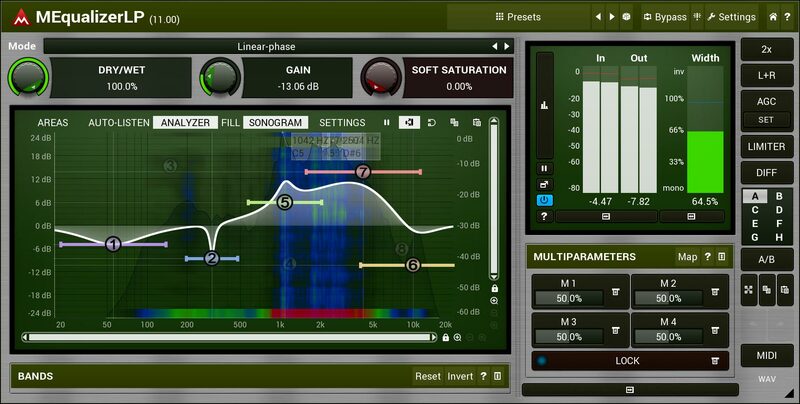 MEqualizerLP is a surgical tool for mastering - it has a clear sound with minimal distortion (measured below -160dB). It doesn't smear transients or create mud, nor does it alter the imaging and depth information of the original sound. It is especially useful to enhance or correct difficult material like vocal or instrumental soloists and groups, orchestral recordings and complex mixes, without introducing any unwanted coloring. 8 band parametric linear phase equalizer with 7 types of filters - peak, low-shelf, high-shelf, low-pass, high-pass, band-pass, notch. 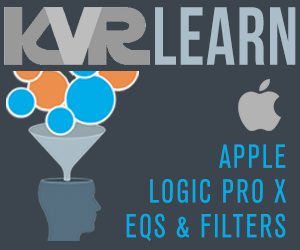 3 equalization algorithms with (approximately) the same frequency response - true bidirectional filtering algorithm, FFT algorithm and standard non-linear phase equalization. Bidirectional filtering provides maximal accuracy and minimal noise ratio. As a supplement MEqualizerLP implements a standard equalization and FFT algorithm adopted in most cheap linear phase equalizers. This way you check all of the methods and find the best one for particular case. Adjustable dry/wet mix - what is impossible for common equalizers due to phase alteration is not impossible for MEqualizerLP. Advanced and easy to use user interface - You can easily change all values and gain maximal accuracy using Ctrl shortcuts and textual editing. Smooth visualisation of resulting frequency response with almost unlimited zooming. All parameters are adjustable from the graph with very advanced controls, integrated help using F1 or "?" buttons, etc. Adjustable upsampling 1x-4x for an even more accurate response and ability to perform processing in 192kHz and higher sampling rates.